Bang Si-hyuk, the producer of the K-pop phenomenon BTS, made Billboard’s list of “25 Top Innovators” who are “Music’s New Power Generation,” Billboard said on its website on Friday. “The K-populist: BTS — the seven-man K-pop band that South Korean songwriter-producer-executive Bang assembled in 2010 — catapulted into Western-pop consciousness in 2018, notching its first Hot 100 top 10 with ‘Fake Love,’ landing on the cover of Time magazine and ruling the Social 50 chart for 111 weeks (and counting),” Billboard said of the group. The U.S. music magazine quoted Bang as saying that there was no specific strategy dedicated to making a global pop group. “It’s a collaborative process. I promised the members from the very beginning that BTS’ music must come from their own stories,” he said. Bang recently re-signed BTS to the management company he co-founded, Big Hit Entertainment, through 2026. In May last year, the septet won a Billboard Music Award in the Top Social Artist category, their second consecutive victory in the annual fan-voted award category. 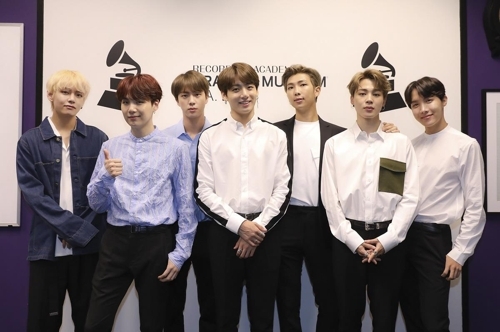 The news of Bang’s selection to the list came as BTS is set to travel to the United States to take the stage as presenters at the 61st annual Grammy Awards slated for Sunday in Los Angeles. BTS is the first South Korean artist to appear for a Grammy Awards event. HuskyFox, a South Korean branding firm that designed the jacket for BTS’ third full-length album “Love Yourself: Tear,” will compete in the award ceremony’s Best Recording Package category.